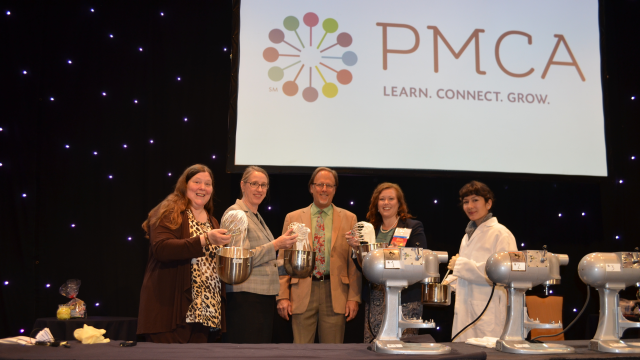 (PMCA — June 28, 2016 – Bethlehem, PA) — PMCA’s Production Conference Program Committee has named John Ashby, General Manager, Ingredients Division at California Natural Products, as the twentieth recipient of the Marie Kelso Memorial Award. Mr. Ashby presented a paper titled Beyond Corn Syrup as part of the Basics and Beyond Seminar during the 70th Annual Production Conference on Monday April 11, 2016. PMCA’s Marie Kelso Award Chair Steve Genzoli, Ghirardelli Chocolate Company, will present the award at the Tuesday Evening Banquet during the 71st Annual Production Conference, April 4, 2017 at the Marriott Lancaster at Penn Square. John Ashby joins the ranks of the 19 previous award winners; Edward S. Seguine, Mars Snackfood, Susan L. Hefle, Ph.D., University of Nebraska, Marlene B. Stauffer, Blommer Chocolate Company, Harold H. Schmitz, Ph.D, Mars Snackfood, Nicole Staniec, Firmenich, Bill Dyer, Blommer Chocolate Company, Greg Ziegler, The Pennsylvania State University, Jeffrey Fine, AAK USA, Joe Smillie, Quality Assurance International, (QAI), Cindy Cosmos, Bell Flavors & Fragrances, Richard Hartel, University of Wisconsin – Madison (awarded twice), Tracey Duffey, World Cocoa Foundation, Kurt Muentener, Keymount GmbH, Abdoulaye Traore, Mars Chocolate, Jordana Swank, The Hershey Company, Joseph Bell, Joseph Bell Consulting, Kerry Kaylegian, The Pennsylvania State University and Mark Kline, The Hershey Company. PMCA’s Board of Directors established the award in 1997. It is given each year to the author of the paper presented at the previous year’s annual production conference that most significantly contributes to industry knowledge, thus honoring the memory of Marie Kelso and her faithful dedication and unwavering belief in the value of the production conference for the industry. Marie Kelso served as secretary to the Production Conference Committee for 38 years, and indeed her name became synonymous with the event itself. In her youth she was secretary to Hans Dresel, a salesman for Felton Chemical Company in Philadelphia, PA. As her boss worked tirelessly to organize and promote PMCA’s Annual Production Conference, as well as AACT events, she organized and managed tirelessly as well. After she left her job at Felton Chemical, the Production Conference became her life’s work. Marie was also active for many years in the Philadelphia Section of AACT. Marie Kelso passed away in September 1995. Enhancing the companies and careers of confectionery and snack professionals through inspired learning and the building of long-term personal connections, which empowers our members to create products that bring people joy!